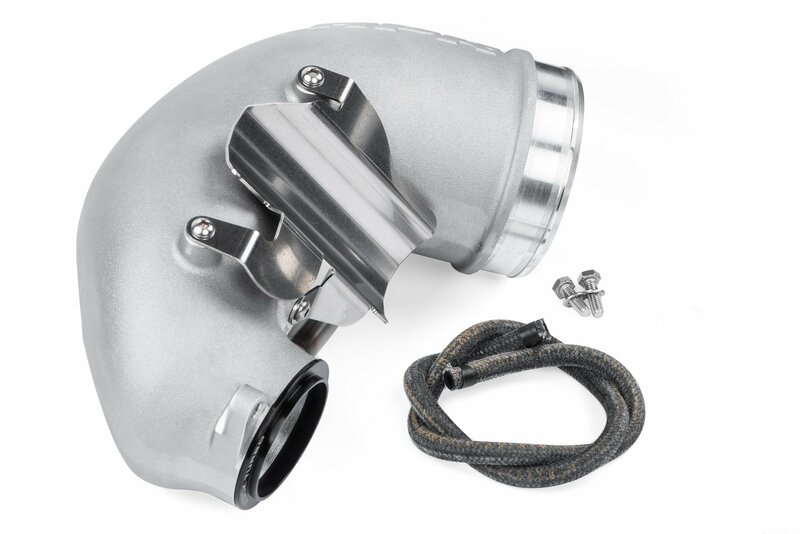 For the DIY customers looking to adapt our inlet system to other intake setups, we offer the Carbon Fiber Back Tube and Cast Aluminum Turbo Inlet separately. Please note, this may require special couplers to adapt to other intake systems. The factory cast inlet pipe is small. It has a maximum internal diameter of 2.8”, at the widest point, and is internally restricted as illustrated in the photos. This pipe is only capable of achieving a maximum of 490 CFM at 28” of H2O when tested alone. 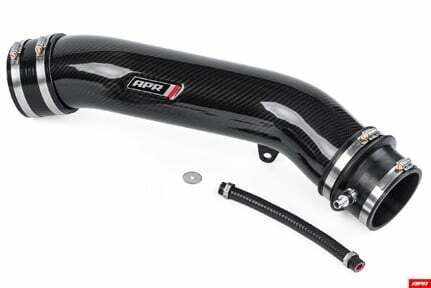 Attaching any intake system to this pipe will only result in a lower flow rate, and when using the factory back pipe, airbox, filter and inlet scoop, airflow drops below 430 CFM. Our cast inlet pipe is huge and on its own it achieves a staggering 710 CFM with the stock turbocharger adaptor! This is a 45% improvement over the factory part. When paired with APR’s upcoming intake system, airflow only drops to 690 CFM, a 60% improvement over the entire stock intake system! 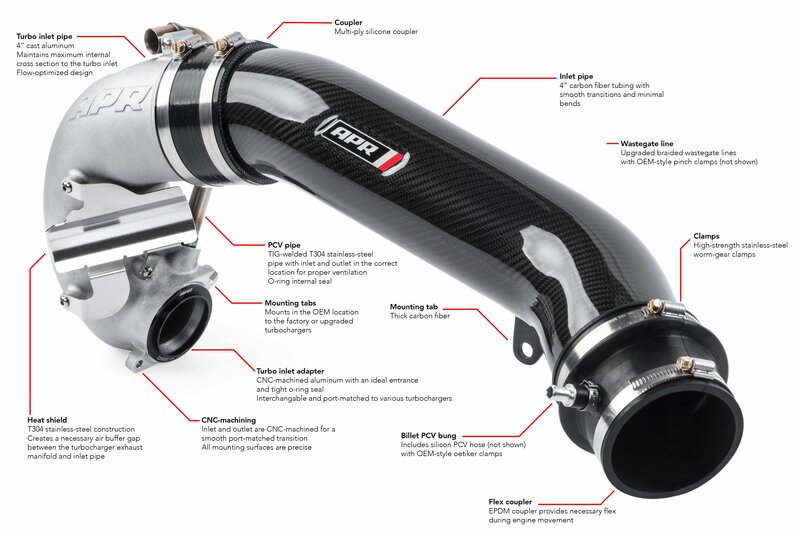 When attached to the factory airbox, filter and frontal scoop, airflow drops to 575 CFM, which is 34% better than the stock system and 17% better than the stock inlet by itself with an ideal entrance. 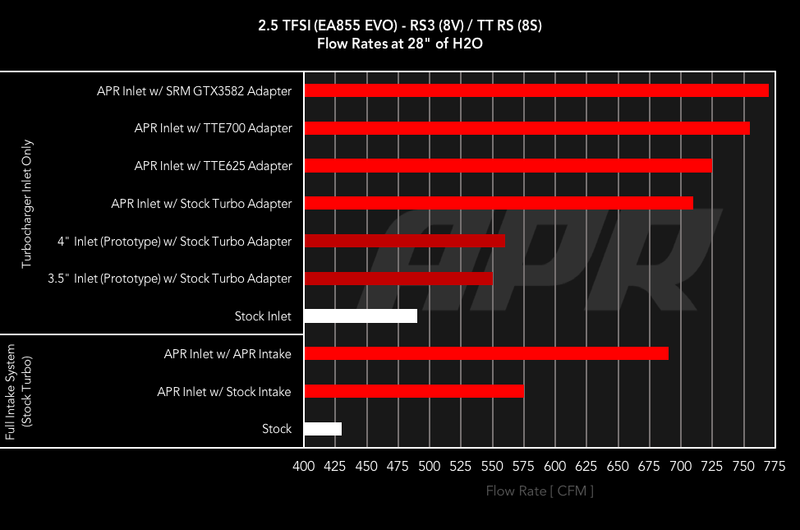 This further clarifies the point that no intake can outperform the APR turbo inlet if the factory turbo inlet is left intact. APR’s engineers tested a multitude of other turbocharger inlet designs in pursuit of more flow and power. It was quickly determined the part could not act as an upgrade on its own because of the significant increase in diameter required. The rear inlet pipe also had to be upgraded to utilize this larger diameter. Other designs, which may look smoother, and offer a continuously reducing taper, are extremely limited. At 3.5”, 550 CFM is achievable. At 4” 560 is achievable. In contrast, our system achieves 710 CFM under the same test. Given how restrictive these other designs are, upgrading to our system, while still using the factory airbox, filter and frontal scoop, will outflow any intake system! 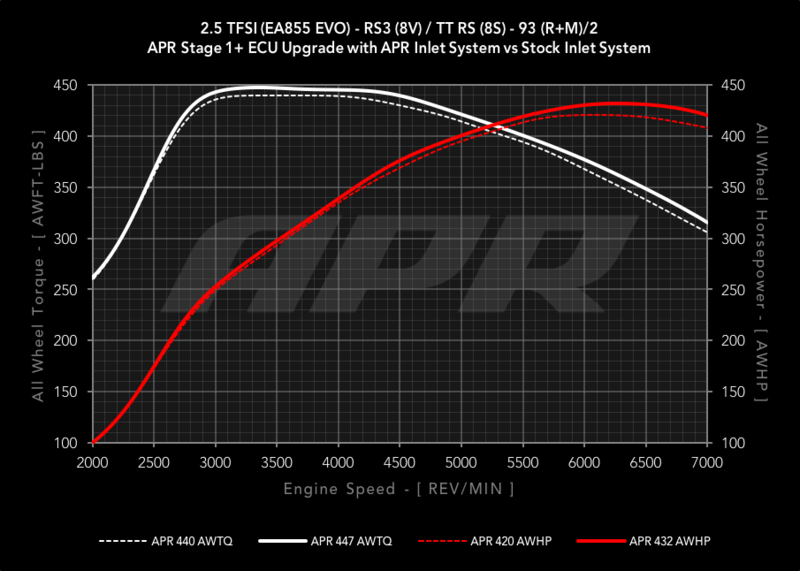 The APR Inlet System greatly outflows the factory inlet system, and for this reason, APR’s engineers have created a Stage 1+ ECU to take full advantage of the upgrade. While Stage 1+ is designed for use with an intercooler system, we tested the upgrade with the factory intercooler system to illustrate the gain from the inlet alone. 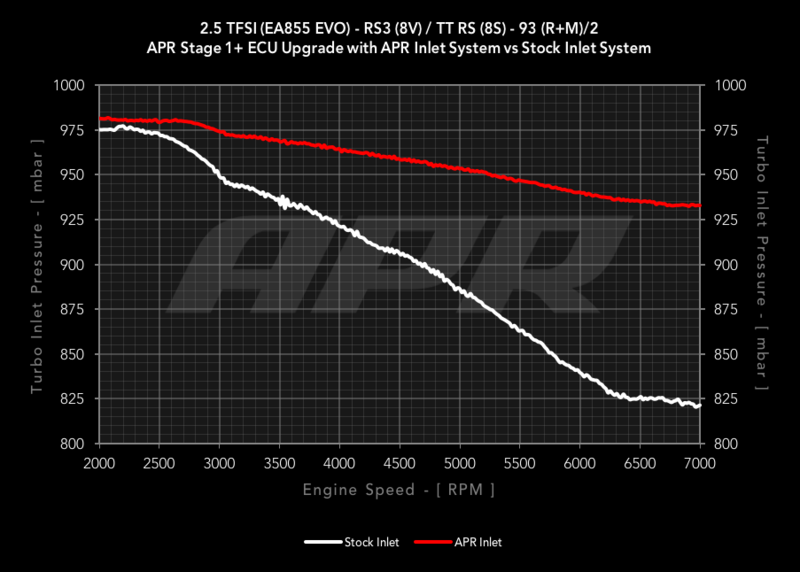 In doing so, the APR Inlet system gained as much as 14 WHP and 11 WFT-LBS of Torque! 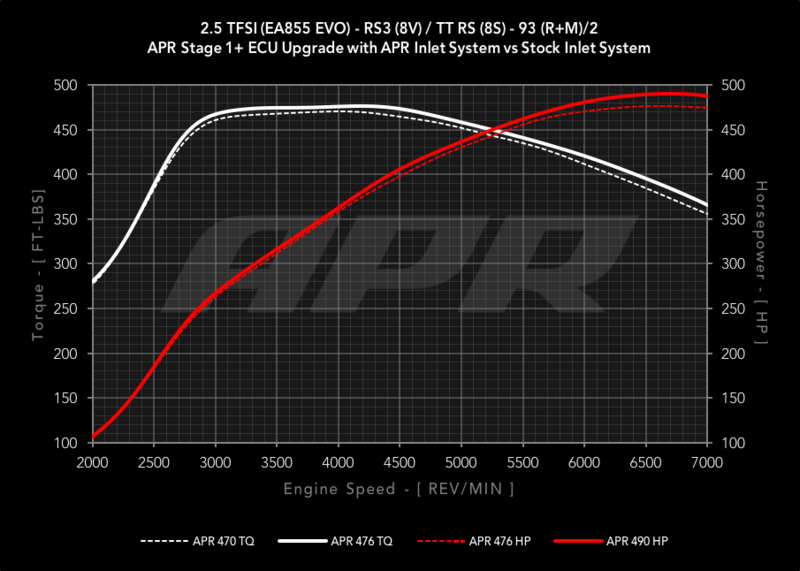 When combined with the APR Intercooler system gains grew further to 37 WHP and 29 WFT-LBS. Gains will continue to grow as higher demands are put on the system via higher stages of performance. APR’s Engineers fully instrumented the engine with pressure sensors and thermocouples (fast response temperature sensors) to further illustrate the affects this product has on the system as a whole. In the simplest terms, this upgrade allows the turbocharger to operate at a lower pressure ratio, which means it will operate more efficiently. It reduces the restriction on the inlet of the turbocharger, allowing the inlet to see closer to ambient pressure conditions. This directly translates to lower pre-turbine backpressure (EMAP), lower turbocharger shaft speed, lower turbocharger compressor discharge temperature, and for the ability to achieve higher boost pressure levels. The following data was collected with ambient conditions sitting around 985 mbar, 29.4C with 66% relative humidity. 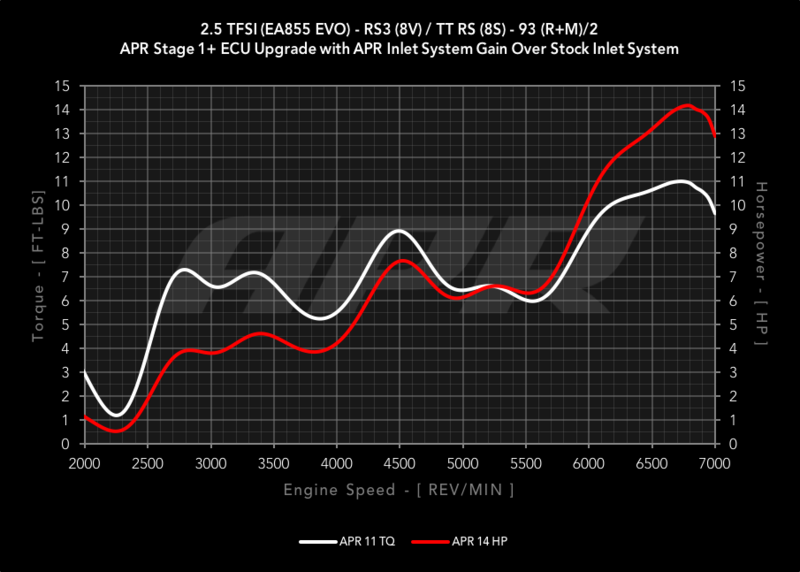 The vehicle was setup as Stage 1 (93) with stock hardware, vs Stage 1+ (93) with the APR Inlet. The depression at the inlet decreased by 112 mbar, emap decreased 360 mbar, compressor discharge temperature dropped 14c and the engine was able to achieve 106 mbar more boost pressure by redline. This directly translated to more horsepower and torque, while everything ran cooler and more efficiently.